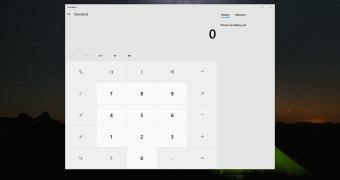 The Windows Calculator app has received several improvements in the recently-released Windows 10 October 2018 Update, but one change that comes without any prior announcement concerns the actual dimensions of the window. For some reason, the Windows 10 Calculator app now takes nearly the full screen when launching for the first time, and as you can see in the screenshot here, pretty much everything is huge, including here the history and the memory sections. Obviously, these huge dimensions of the Calculator window are just the right choice on touch devices where doing math operations with touch input would be much easier, but on PCs where the mouse and keyboard continue to be users’ favorite choices, everything looks awkward. Needless to say, for users coming from Windows 7 or older, the change is unexpected, to say the least, especially when taking into account how the Windows calculator looked like nearly ten years ago.